← Why Is There a QR Code on My Banana? They have a machine called “Opus” that can print out books on demand, right in the store, many of them self-published works by local authors. 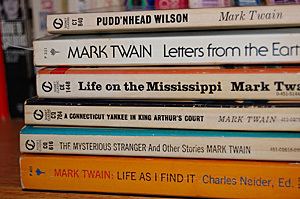 You also can find rare out-of-print books by Shakespeare and Mark Twain, as well as titles in the public domain. This seems to be a nice alternative to the digital book readers, especially for books that would be hard to find elsewhere. The concept is intriguing – you can look up the books in a database, and then go to the store and have it printed out on the spot. A bookseller at the store said that this way, “consumers now have control over the publishing process, from deciding the physical dimensions, cover, and layout to how much they want to pay for it.” And independent authors have a way to more broadly distribute their books. As I mentioned in a previous blog about newspapers (The End of an Era? ), I do like the tactile experience of reading a printed publication. I find that with a paper book, I can easily thumb back to find an earlier mention of a person or an event. Somehow just holding the book, I can remember approximately how far back the reference was, which side of the page, and where on the page to look. I know that digital readers are seen as the wave of the future, but this seems like a win-win for everyone. This entry was posted in JK Hanson Wordcraft, Uncategorized and tagged books, digital publishing, digital readers, print on demand, publications. Bookmark the permalink.